Atkins Library has created quick how-to videos to demonstrate how to use the library catalog to find books, request materials through Interlibrary Loan, and more. You can easily embed or share a link to these videos in Moodle when students are preparing for specific research assignments. Below are just a few of the videos. You can find more on the Atkins Library YouTube Channel and at the new Library Instruction Program page. 1. How to identify whether or not the library owns a book. 2. 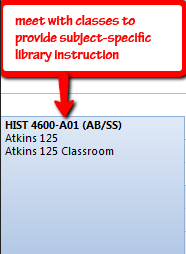 How to request materials that are unavailable at Atkins Library. 3. Finding a book on the shelf. This week I leave for the annual conference of the American Library Association with an expected attendance of more than 25,000 people (yep, there are that many of us, plus the vendors). At the conference, I will do as faculty do at conferences: attend committee meetings and presentations relevant to my work and interests, meet with vendors, and network and reconnect with my peers. Sometimes when I tell faculty that I am presenting at a conference or working on research they nod but I imagine they secretly wonder what it is we do as librarians. So this post is for you! 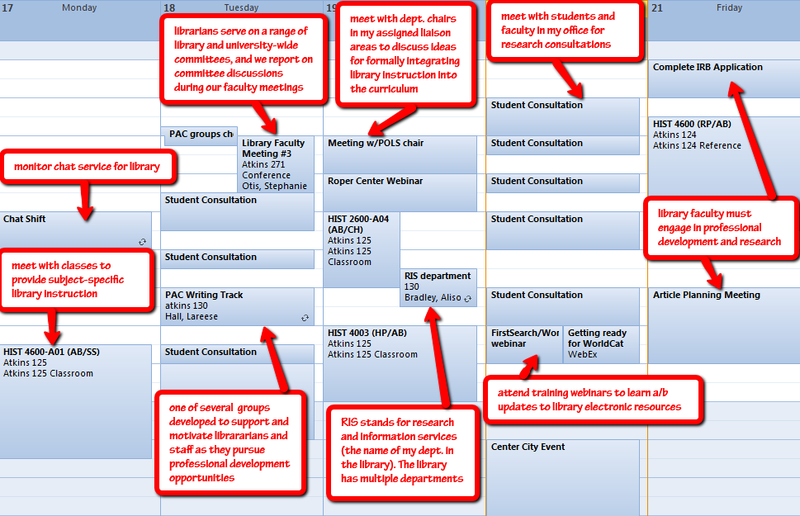 The fact that there is no typical week in the life of a subject librarian is exactly what I love about my job. Some weeks are busier than others, and our work and schedules change throughout the semester. While the responsibilities and expectations of subject librarians may vary by subject and institution, the following reflects many of the activities we are able and expected to engage in at work. Click on the image below to get a glimpse of one of my weeks last semester. Librarians in the classroom. Meeting with classes allows me to offer course-specific library instruction that engages students and faculty in a conversation about information, how it is produced, and how to effectively find, evaluate and use it. This week reflects my efforts to fully integrate myself into the core History classes required of History majors, thereby contributing to the integration of information literacy instruction throughout the curriculum. Meetings, meetings, meetings. 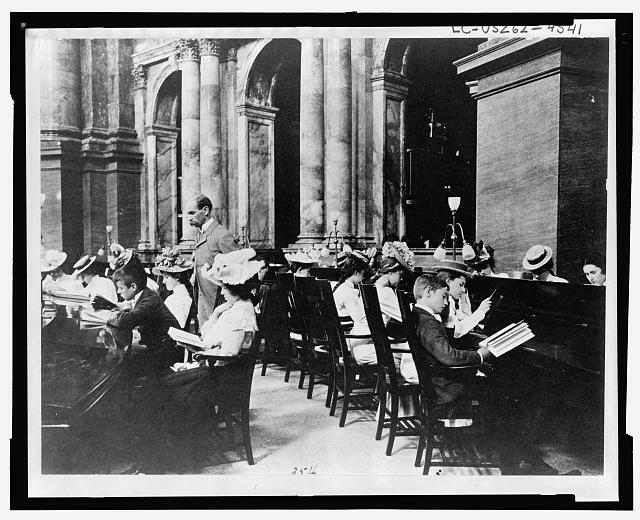 Subject librarians serve on a variety of library and university-wide committees. Some of us also serve on committees for local, national and international library associations. As faculty, we have expectations for service. I currently serve on the Faculty Research Grants Committee, the Library Professional Activities Committee (as Chair), and two national library association committees. I was also elected as Vice-Chair/Chair Elect of the Library Faculty. Reference and research support. We regularly assist students and faculty with research. This week I provided in-person research consultations for 9 students in four of my five assigned liaison areas, including History, Political Science, Latin American Studies, and Anthropology. What my calendar from this week does not show are the e-mails I am responding to before and after these appointments. Resources, resources, resources. An important part of being a subject librarian is staying abreast of changes to the databases and other electronic resources and systems we use (and there are many); learning about new resources that become available, and evaluating their potential value for the library collection; and finally, evaluating the usage statistics for our current collections. This work requires attending webinars and trainings related to library products (this week I attended two), meeting with vendors on-site or at library conferences, and collaborating with the other subject librarians, as well as the librarians and staff in Collection Development. I am also currently responsible for a monographs budget of more than $30,000. Communication. The time I spend communicating with my liaison departments; offering research consultations and library instruction; and keeping up with and sharing news and developments related to my work, my profession, and that of my liaison departments and the university, is part of the value I add to the library and to the university. Professional development and research. Subject librarians at my university are faculty and therefore must be productive in the areas of research and professional development. What, might you ask, do librarians research? It really depends on their interests, but generally it contributes to the field of library and information science. My research directly relates to my practices as a librarian which allows me to continually improve upon my skills and contribute to the profession more broadly. Some of my research has been published in books (see College Libraries and Student Culture and Mobile Library Services: Best Practices) and other parts of my research have been presented at conferences (see Mapping History: Toward a Curriculum-Integrated Information Literacy Program). I will next be presenting on new models of support for professional development in libraries at the upcoming Conference for Entrepreneurial Librarians. Zan Zig performing with rabbit and roses, including hat trick and levitation. 1899. 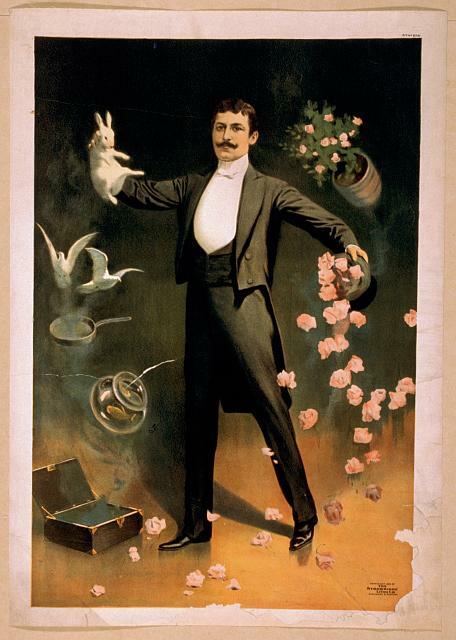 Magic Poster Collection, Library of Congress Prints and Photographs Division. In the Spring semester I received many e-mails from students who needed help with research, and several asked of me: “work your magic.” My first reaction was, “Aw!!! They value what I do.” Next, I thought, “Magic?! I wish.” Research can be a complex, mysterious and messy process. Students may think librarians have magic tricks up their sleeves (well, sometimes we do) but oftentimes helping students takes work and lots of time. 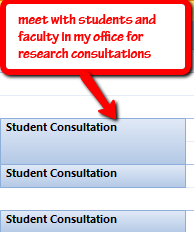 I worry when responding to student e-mails with suggestions that they think I just whipped up some magic answers. I sometimes have to spend hours of searching to steer students in the right direction, or I have to reach out to my colleagues in the field. If students think research is magically easy, they may not persist in their own searches when they do not succeed right away. That title, or something to that effect, is my idea for a series of videos that would include interviews and other content from librarians, archivists, and professors that demystify the research process. While I do get a kick out of hearing students call what I do “magic”, I want students to understand what goes into the research process, and a lengthy e-mail to them that explains what I do will not suffice. This idea for a video series first came to me when I started working with students in a Historiography class. Putting together a historiography can be a complex process and explaining the various methods students can use to find appropriate sources can be difficult to explain. The same can be true for finding primary sources. It would be great to collaborate with some History faculty on a series of videos that explain what it takes to do research in this field. It could include interviews with historians and have them explain what process they went through to conduct their own professional research. I could also see this working for political science students with finding data. What I would most want to expose would be the messiness of research – a realistic portrait of what goes into the process (and not just how it should work but how it actually works), from Google, to librarians and other information networks, to library resources and beyond. The more we talk about and share what we actually do, the better we can help students, and honestly, help each other as professionals. Recently I purchased a 1,000 piece puzzle and began working on it at home. It has clearly been some time since I worked on a puzzle because I found myself feeling quite inadequate and frustrated at getting it started. After a few nights of working on it and getting into the groove of puzzle piecing I realized that putting together a puzzle is similar to the research process. It seems so obvious. Librarians have been working to create games that are designed to help students understand the research process… but maybe we should just give them a puzzle? Below are the similarities I observed in my puzzle piecing process. 1. The research process can be frustrating. Don’t fight it. I often tell students to step away from their research when this happens, and revisit it the next day. I cannot tell you how many times I have searched with certain keywords/phrases on one day with no success, only to try it again the next day and start to find what I need. It is magic. Same thing with puzzles. 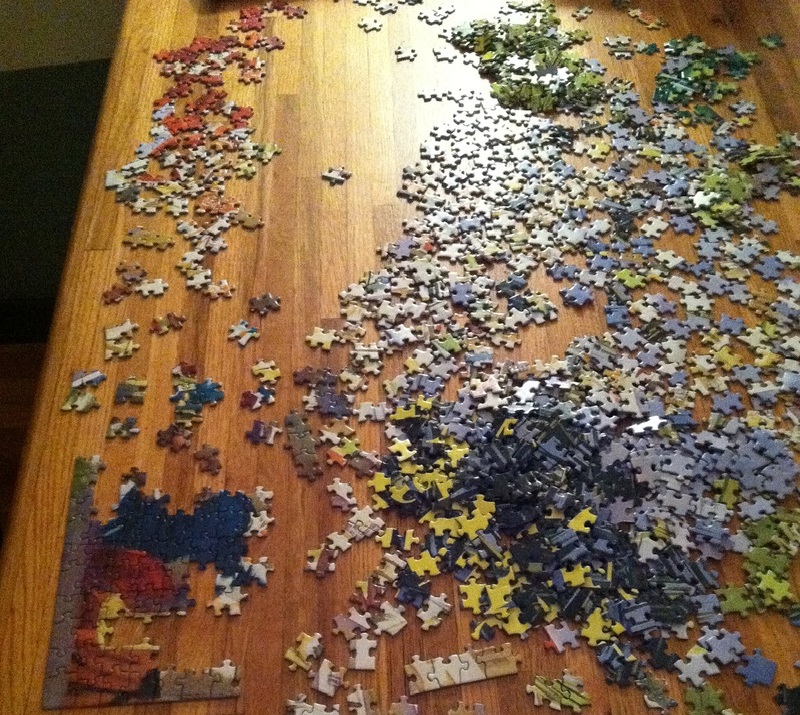 My first night of working on the puzzle, the pieces just were not fitting… and forcing myself to keep at it was not helping. When I came back to it the next night with fresh eyes, I somehow saw the pieces differently, and was able to make connections. As we always remind students, research is a process, it takes time, and that is why we encourage them to give themselves enough time to go through the process. 2. Separate out the edges. Organization of research materials and ideas will help when you need to bring everything together while also minimizing your frustrations. After my first night at the puzzle I realized that it would be less overwhelming if I started pulling out the edge pieces and grouped like-colored pieces together. This allowed me to begin to create the framework for the puzzle. When I began to hit a wall with one group, I would move on to another group of pieces. Managing the research pieces will help you feel more in control of the process (even when you are not) and will give you smaller problems to work on when you feel overwhelmed by the whole. 3. Don’t give up! Too often I meet with students who have abandoned several perfectly good topics because they were not able to find any resources on their own. It is easy for me to tell students to not give up on puzzles, because the stakes are low. Research topics are tied to papers, classes, and ultimately grades. In life and work, we cannot always choose our struggles, so we should learn how to manage them. I would rather see students working on topics that interest them than simply choosing something that is easy but I know that this is not always an option. Librarians are a great resource for students that have determined that nothing exists on a given research topic. 4. Remember your goals and track your progress. 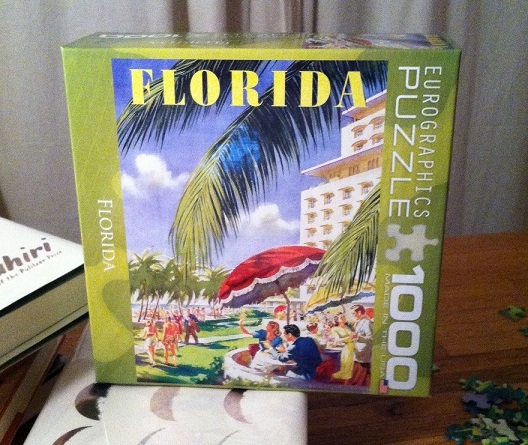 When I’m feeling frustrated with the puzzle, I pick up the puzzle box containing the image I am trying to create. When students are feeling lost or confused, they should review their assignment, assignment expectations, and the topic/research question/hypothesis they set out to explore. If they have created an outline, they should revisit it to remind themselves where they are in the process. 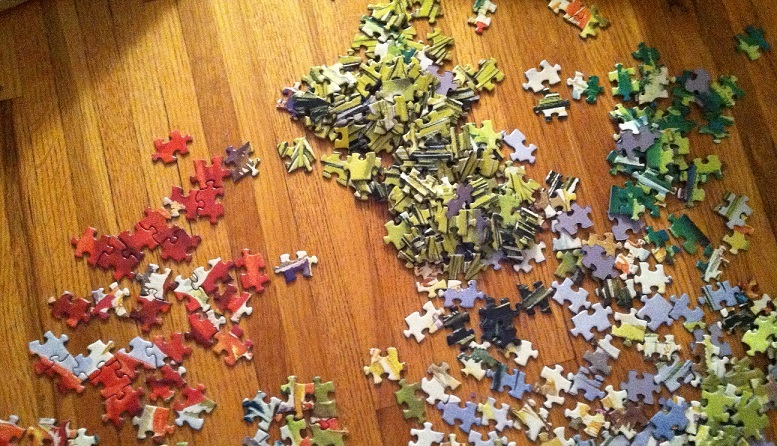 Solving a puzzle is not the same as researching and writing a paper but it certainly can teach us how to better and more efficiently manage the process. Working on a puzzle teaches patience and requires you to balance focusing on small pieces while also stepping back to think about the big picture. What if we assigned students to work on massive puzzles throughout the semester, as they are also working on research projects? Would it have an impact on students? Would they see the correlations? Would seeing the correlations help them through the research process? Are there other academic activities (such as group work) that the puzzle metaphor could relate to? The following workshop is designed for instructors at UNC Charlotte. What makes a good researcher? Knowing that the research process involves more than the search for information sources, what steps can we take to improve our students’ critical reading, thinking and writing abilities? This workshop will introduce a collaborative effort between Joyce Dalsheim (Global, International, and Area Studies) and Stephanie Otis (Atkins Library) to teach students the importance of critical reading in the research process and in independent learning. Tracing backward through the research process most of us have come to take for granted, this workshop offers a set of strategies that shift the focus of research from “search” to “think” and from information gathering to in-depth reading. Dalsheim and Otis have developed a set of strategies for the classroom and for library instruction sessions to model and develop critical reading and thinking with students. The strategies are designed to promote the skills and confidence students need to become independent researchers. Based on a two-year collaborative project, Otis and Dalsheim will present an overview of their approach, and will also introduce specific strategies for honing students’ skills in critical reading and synthesizing material—the basic building blocks of good research. Participants will leave with ideas for incorporating these strategies into their own classes in partnership with the library. Part of preparing students to work as the potential scholars of the future is engaging them in the scholarly discussion surrounding the publishing and distribution of scholarly research. Such discussions can explain why libraries pay thousands of dollars for databases, and they can also introduce the open access movement, and new models for measuring the impact of scholarly work. Introduce short discussions in class on the nature of scholarly publishing and use yourself as an example. All of you have published and some of you even edit journals; explain the process so that students understand why you require and value peer-reviewed or scholarly sources. 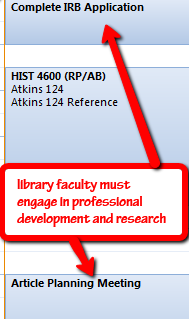 Last year I started calling on faculty during library instruction sessions to discuss their own research with their students. This conversation helps students understand what you do beyond teaching, and it can also get them thinking about whether or not your profession interests them. You can also use these discussions in class to promote the opportunities that students have to begin their own work as scholars. The annual UNC Charlotte Undergraduate Research Conference and Graduate Research Symposium are just two opportunities. Special Collections at UNC Charlotte provides a picture to the past and a way to incorporate rare and unique materials into the classroom. This summer, Special Collections connected with HIST 4600: Racial Violence in America, a course that examines the nature and the history of racial violence in the United States from the end of the Civil War to the present. Special Collections has an abundance of rich collections that support this course topic which includes primary source material related to race relations from slavery to civil rights issues from the past to present. Students in the HIST 4600 course visited the Special Collections Reading Room and were introduced to some of the materials relevant to the course topic. An online research guide was created for the course to provide students with more information about the manuscripts collections. In working with these materials, students were assigned to establish how the collections might be used in writing history. After selecting a manuscripts collection of interest to them, each student had the opportunity to examine one of a kind, first- hand documents such as diaries, photographs, letters and other items pertaining to their class topic. They discovered the value of working with primary source material and the pleasure of engaging with original documents, a practice that can enhance the learning experience. Learn more about Special Collections by browsing the website or visiting the Reading Room on the 10th floor of Atkins Library. Denelle Eads is Special Collections Research and Outreach Librarian at UNC Charlotte Atkins Library. Contact Denelle if you are interested in developing an archives assignment for your class. In presenting an assignment, consider these goals in the way you write and discuss the assignment with students. It seems basic, but can be a big help for students if you go over the assignment as a class rather than just posting it in Moodle or on the syllabus and pointing it out to students. There may be terminology they don’t know: if you’re asking them to synthesize or analyze information, explain what that means or give examples of what that work will look like. We can’t expect students to stop simply cobbling together excerpts from random sources if we never teach them what we expect them to accomplish. Other terminology sticking points for students might be secondary vs. primary sources, scholarly/peer reviewed articles, and thesis or research question. Talk to students about the type of sources you expect and show them examples. Talk to students about the peer review process. Include your own experiences with research and writing in your discipline. By sharing your work and the process of research, writing, and publishing outside of a class assignment, students can be encouraged to join in the conversation with their own work. One way to help students better understand and accomplish your goals for them is to give them guideposts along the way. Many college-level research assignments ask students to undertake the process of locating, evaluating, and incorporating information sources as one uninterrupted endeavor they face on their own. The anxiety that accompanies such assignments may not be so much about students’ inability to find sources, but a lack of direction and support in what they should do with those sources in order to successfully complete a research project. Rather than assigning one large research project where students are expected to work along on their own and turn in one product, have them work along the way on smaller pieces. This process will help them better understand the steps in the process and different levels or types of information. Instead of simply asking students to use academic sources, have them compare a popular source to an academic one to understand how some sources work better than others for research projects. Students won’t take for granted, like we do, that academic sources are “better,” we have to show them how and why we’re asking for something other than a website or an encyclopedia article for their papers. A simple iteration of this approach is to ask students to summarize and evaluate single sources on a topic that may contribute to a more extensive exploration of that topic. As a starting point, the instructor or librarian can provide students with an initial source and structure in groups or whole-class work to answer the questions and build the summary/evaluation. Once students have seen how the process of summarizing and evaluating works, they can apply the questions to additional sources and incorporate this approach into larger research projects. Here are a couple of smaller activities that could be used in place of or in progress towards a research paper: Research Assignment Activities. By integrating conversations such as these into class sessions or assignments, we better articulate and support the steps in the research process that we expect students to accomplish. Stephanie Otis is Instruction Coordinator at the UNC Charlotte Atkins Library. You can learn more tips from Stephanie by reading her chapter, “Before Search: A Scaffolded Approach to Teaching Research” in the recently published, Successful Strategies for Teaching Undergraduate Research. Schedule a library instruction session for a date in the semester when your students will already have been assigned a research paper or project. Students value library instruction sessions most when they come into it knowing their topic or question and can use the session to get started with their research. Inform your students in advance that they will have time during the library session to find sources for their papers. Provide your librarian with a copy of the assignment so that they are aware of your expectations for sources. If the purpose of the library instruction session is to help students prepare for a paper or assignment, review the assignment with the students in class before the library session, and assign them to submit their topics to you in advance. Students are generally better behaved and more engaged when you are present during library sessions, but if you cannot be present, prepare your students for the library visit and possibly allow the librarian to prepare a quiz. Notify your librarian if you plan to send all of your students to them for help. One-on-one or group consultations with a librarian are a great way for students to become more successful as researchers. If all of your students are working with a similar topic, the librarian can create quick online tutorials and research guides to easily assist all of them at the point of need. Not sure why you want your students to have a library session? Contact your subject librarian to discuss ideas. Library instruction can take many forms. We want students to have positive experiences with the library, and we can help make that happen by working with you to design intentional library instruction.